Hands-up who doesn't love meatballs? No you have to put your hands up hiiiiggh, I can't see them. What? Oh there aren't any people like that? Yup,that's what I thought. Yes, I'm a meatball lover, but I'm a bit of a late bloomer. When I was growing up, my mom never made meatballs (well, not that I can remember anyway) and so, when I started cooking for myself it never really crossed my mind to make them. I kind of thought they would be a lot of effort and quite frankly didn't think they were that great. I mean sure they were good, but not worth a few hours of slaving in the kitchen. Well it turns out I was wrong. Not only are they much quicker to make than I thought all along, it also turns out that with the right flavourings they can really be transformed into something delicious. Something which became evident again with the first mouthful of my Swedish meatballs. So I started looking at other meatball recipes. 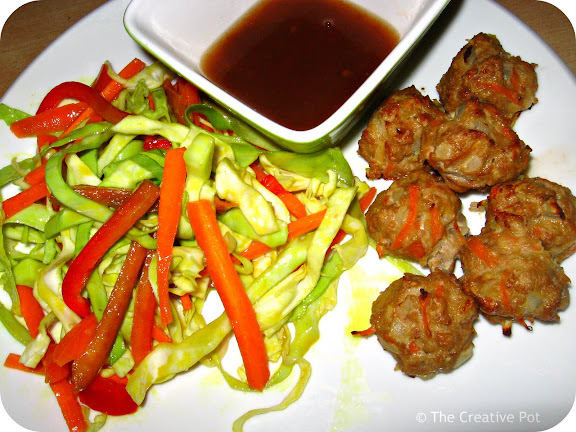 And just looked what I stumbled across while browsing through some Filipino recipes online. A perfect partner for my sunshine salad. These are unusual in that they combine grated sweetpotato and carrot with the meat and gives them a softer texture and also quite a cool spicy appearance. They are quite mild in flavour, perfect for off-setting a more spicy side-dish or dipping sauce. And isn't that what you want from a great meatball? 1. Mix all the ingredients together. Form into small balls and place on a greased baking tray. 2. Bake in a preheated oven at 180C for about 20 minutes, or until browned and cooked through. Your recipe gave me such a good laugh, all my crew are Filipino and of course I eat loads of Filipino food, so when saying what about doing Bola Bola again, the entire team burst out laughing and asking where I knew that from.....anyway to cut the long story short, we have it for dinner tonight! This is a most Creative blog, pardon the pun!! I am impressed with your eagerness to try new recipes all the time!!! Glad to have been of service Country Gourmet! I hope your crew liked it. I think what I love about meatballs is how many different flavors you can infuse into them. Just like burgers, there are so many variations and they are just so fun to eat! I really like the idea of sweet potatoes in these. Right up my alley.